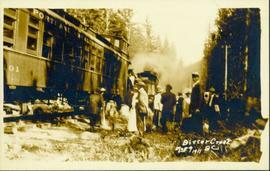 Side perspective photograph of a crowd of people gathered around a Portland Canal Short Line Railroad train, presumably either leaving or arriving Printed annotation on recto reads: "Bitter Creek BC Aug 9 1911." 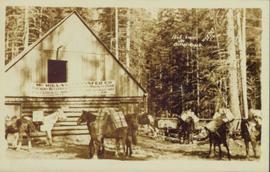 Photograph of many loaded pack horses in front of the "McMillan Transfer Company." Printed annotation on recto reads: "Pack-Train At Bitter-Creek Hughes 116." 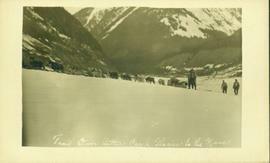 Photograph of a team of sled dogs pulling a load, followed by a group of men. 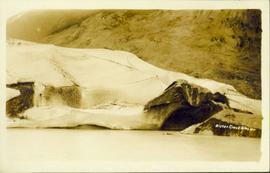 Mountains are visible in the background. 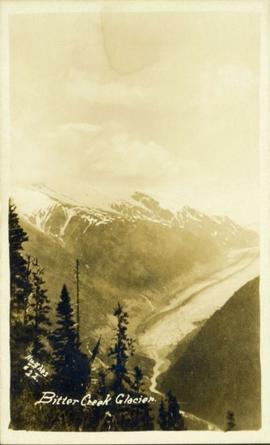 Printed annotation on recto reads: "Trail Over Bitter Creek Glacier to the Naas."